A reliable source for Portable Workbenches information and a resource for accessing leading Portable Workbenches and suppliers. Portable workbenches are non-stationary, task driven workspaces designed to provide efficient and mobile units in a variety of industrial, commercial and residential environments. The term workbench can be misleading as these constructs often consist of a flat table-like work surface and the attached components, such as drawers and shelving, needed to improve organization and productivity by creating easy access to all tools and supplies required for the completion of a task. While stationary workstations are often formatted to one specific job, portable options must remain more fluid in their configuration as they may be used for multiple tasks. For this reason many of these units are not only portable, but modular workstations as well with the ability to be adjusted in several manners such as height, storage capabilities and power supply in the case of electronics. Length, width, load capacity and surface type are additional features that may be adjustable on some models. Portable Workbenches Portable workbenches are non-stationary, task driven workspaces designed to provide efficient and mobile units in a variety of industrial, commercial and residential environments. There are two main types of portable workbenches, those with casters or wheels and those that fold or collapse. 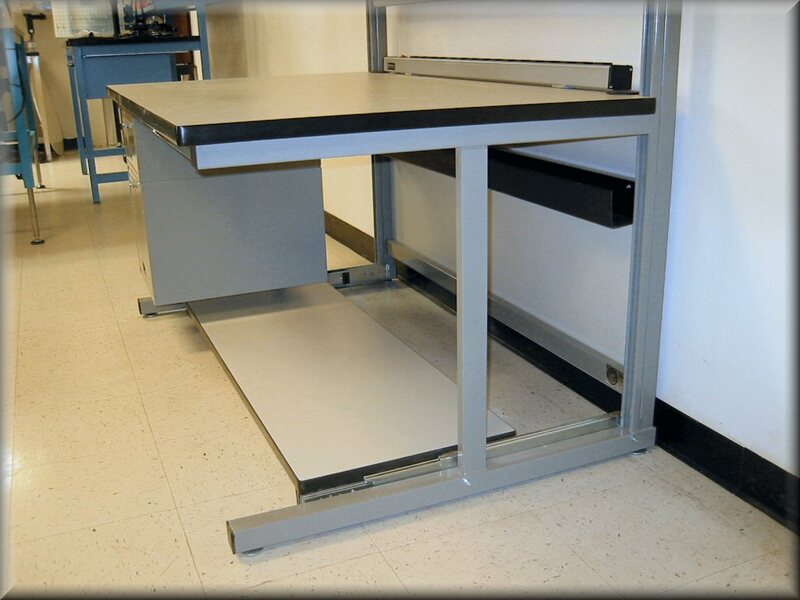 Casters and wheels attached to the base or legs of a mobile workstation allows that station to be easily slid from one area to the next without disrupting the state of the work in progress on the desk or the order of equipment. Rolling benches, however, cannot be easily transported over rough terrain or stairs. Folding or collapsible workbenches are built with hinges and removable apparatus that allow the sturdy structure to be slightly disassembled in order to move it. While these can be transferred across any surface since they are carried, the tools and supplies must be carefully stowed to avoid damage. Additionally, these folded workstations must be made of light materials as heavy stations would be very difficult to move. Though some steel, hardwood or aluminum may be used as support or framing, common materials needed for portability include polymers, plastics, plywood and melamine. Rolling workbenches are often made of these same light-weight materials, though they have the option of heavier elements as they need not be lifted. Metal and plastic components are formed through extrusion, die-cutting, injection molding and other such processes while wooden elements are sawed and sanded. The many components are nailed, bolted, screwed, and welded together with hinges and casters carefully placed to ensure the ease of transport.